In 2008, the Galleries Retail Park in Washington underwent a £20 million regeneration programme in order to improve retail facilities and transport links in the Tyne and Wear area. Construction of the retail park, owned by Prudential Property Investment Management (PRUPIM), was carried out in conjunction with the development of a new state of the art bus terminal, with the objective of providing shoppers with a greater selection of high street outlets and a more comfortable, convenient journey to and from the town centre. 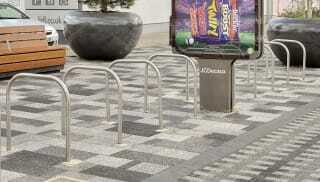 Marshalls was approached by the project architects, Leslie Jones, to meet the centre’s street furniture requirements. The aim was to provide a coordinating, contemporary scheme for the new 103,000 sq ft park, encompassing seating, waste management, cycle parking, tree protection and perimeter security products. Working closely with the project architects and Key Contractor, Miller Construction, Marshalls was able to successfully fulfill the brief through supplying a selection of co-ordinating and stylish street furniture, which also met all functional requirements. 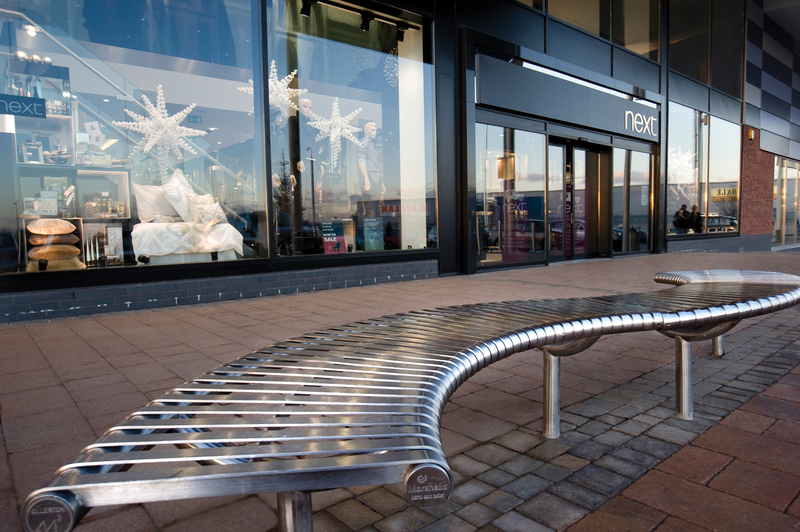 To provide visitors with sufficient space to rest in between outlets, Ollerton M3 benches featuring sweeping serpentine curves were specified, providing a clean, contemporary aesthetic. 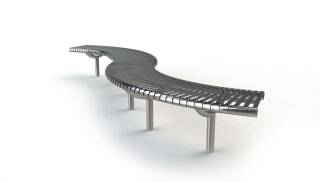 Manufactured from high grade 316L stainless steel, the seats provide an extremely durable solution and are less susceptible to the effects of pitting, staining and corrosion than cheaper, alternative grades. To co-ordinate with the seating, Sheffield cycle stands manufactured from grade 316L stainless steel were supplied to the centre, providing an ideal place for visiting cyclists to securely lock their bikes whilst shopping. 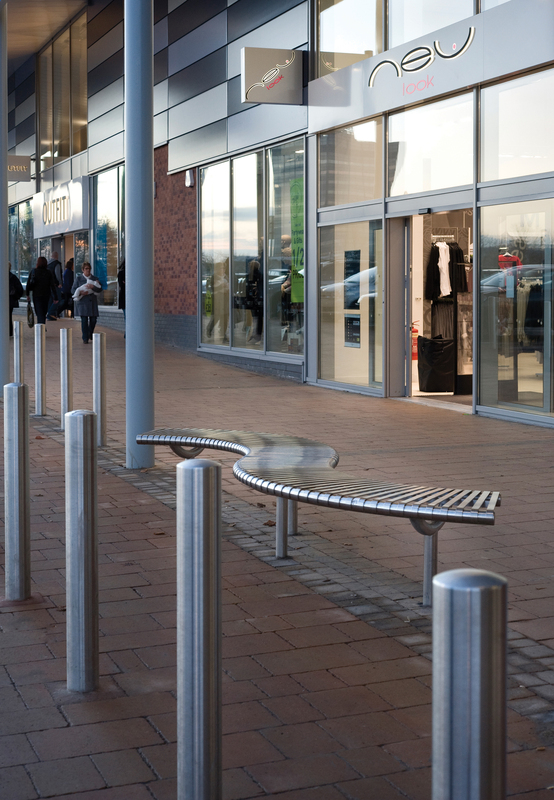 To ensure that pedestrian walkways provide a safe route for shoppers travelling between outlets, Marshalls provided a range of perimeter protection products, including over 100 stainless steel RS 001 bollards. 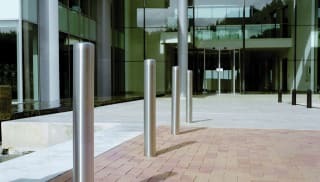 The bollards provide visitors with excellent protection from car park traffic, whilst the grade 316L stainless steel exterior adds a contemporary style and elegance. For areas of the site requiring occasional vehicle access, Marshalls provided Rhino telescopic bollards in two different styles. The RT SQ8 HD is a square, heavy duty bollard, whilst the RT R14 HD is the largest, heavy duty post in the Rhino range, offering maximum protection. 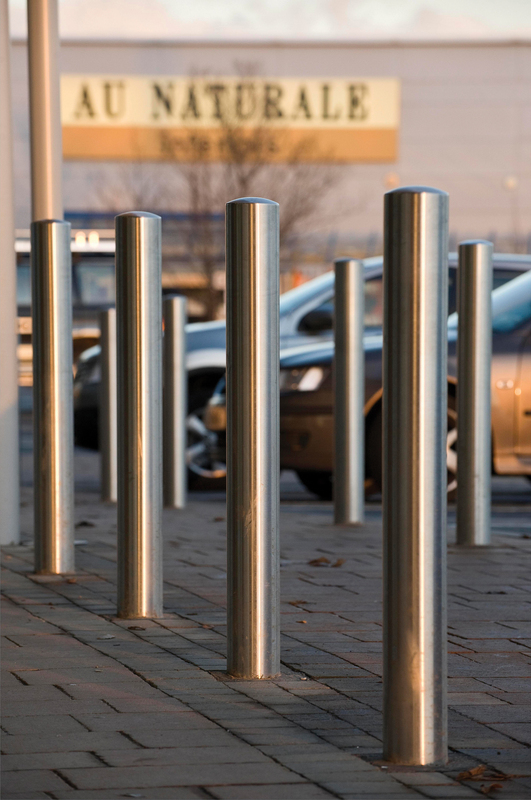 The bollards lock securely into place to provide excellent security and can be easily lowered into the ground to provide access for site maintenance vehicles when required. Sineu Graff litter bins were supplied to the site, which provide an excellent waste disposal solution for a venue that attracts over 13 million visitors a year. The stylish design incorporates a smooth, steel body with laser cut stripes, which are zinc plated and polyester powder coated. To provide protection for developing trees and bushes planted throughout the park, Marshalls supplied the cast iron 59 Series tree grille, ensuring that root growth will not damage the surrounding paving in the future. The regeneration of the retail park has enabled Washington to attract a host of major high street brands to the area, providing local residents with a much greater choice, on their doorstep. The street furniture scheme gives the park a clean, modern style, whilst meeting all of the key functional requirements of a bustling retail centre. The high quality materials used ensure that the products will require little future maintenance to retain their original contemporary appearance. Since its official opening in November 2008, the centre has received excellent feedback from visiting shoppers and Galleries staff. Commenting on the regeneration scheme, the Galleries Centre Manager, Juliette Coard, said “the retail park has turned out exactly as we wanted and the street furniture really adds a special final touch. It looks great, is easy to keep clean and is really durable”.